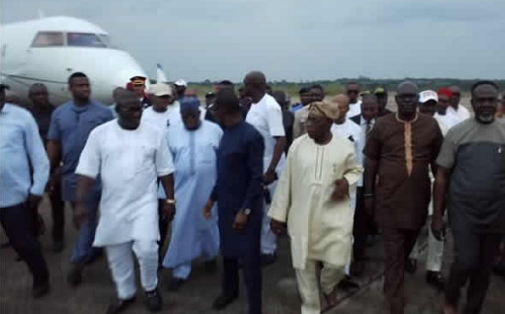 Ex-President Olusegun Obasanjo has landed Asaba, Delta State capital on a two-day working visit to the state. The ex-president arrived Asaba yesterday evening and was received at the airport by Governor Okowa, Speaker of the State House of Assembly, Mr. Sheriff Oborevwori, the state PDP chairman, Olorogun Kingsley Esiso and other top members of the government. Obasanjo is in the state to inugurate the Stephen Keshi Stadium built by Governor Ifeanyi Okowa-led government and other prejects. The stadium which will host it’s first FIFA approved international friendly tomorrow will be inaugurated today.